TANGIER, Morocco (AP) — Lionel Messi won his 33rd title with Barcelona on Sunday to become the most successful player in the Catalan club’s history. 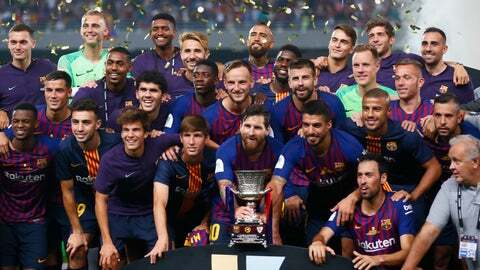 Barcelona beat Sevilla 2-1 in the Spanish Super Cup as Messi overtook Andres Iniesta, who had 32 titles when he left this summer for the Japanese league. Gerard Pique equalized three minutes before halftime when he finished off a free kick by Messi that hit the post and ricocheted off the back of goalkeeper Tomas Vaclik — and again off the upright — before falling to the Barcelona defender.